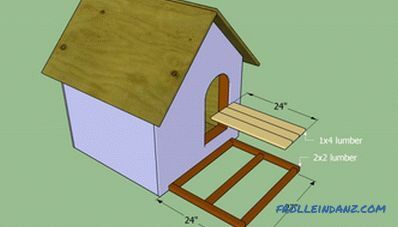 From this article, which is, in fact, a detailed step-by-step instruction, you will learn how to make a dog house with your own hands. And not just a booth, and insulated. Insulating material placed between the two-layer walls of the booth, will help protect your dog not only from frost in winter, but also from the scorching sun in hot summer. Use for this purpose sheets of polystyrene with a thickness of 7-8 cm or rigid insulating foam. 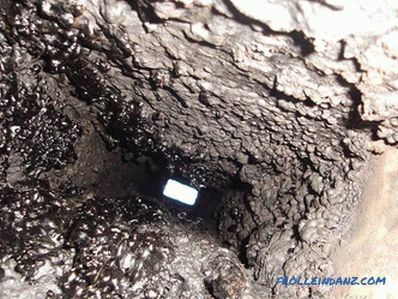 If you want to reduce costs, you can reduce the thickness of the insulating material to 4 cm. 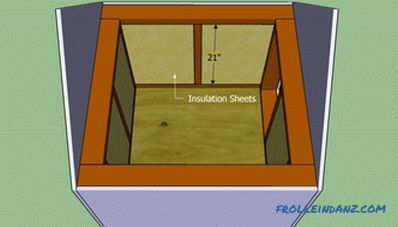 Before beginning construction, you should decide on the size of the booth. 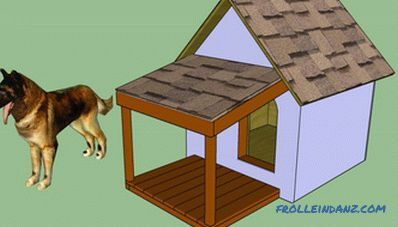 The dog should be able to easily turn inside. Before making a final decision, examine the various design options and choose the one that you prefer. Buy quality materials if you want the result of your work to meet a high professional level. Before starting the project description we will give you some useful tips. Combine the structural elements at both ends before fastening them with screws. Before screwing in the screws, drill guide holes in the lumber, this will help prevent the wood from splitting. Make sure that the walls of the booth are vertical, and the floor and upper beams are perpendicular to them. If you live in a region with a cold climate, use insulation material with a thickness of 7. 5-9 mm, otherwise a thickness of 3-4 cm will be quite enough. 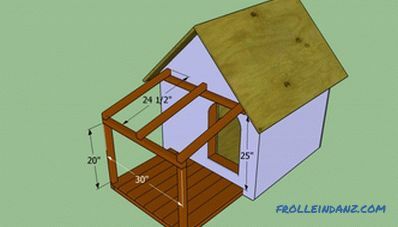 all dimensions in the figures are in inches; to convert to centimeters, use the formula: 1 inch = 2. 5 cm. The first stage of the project is to create the base of the booth. Make a frame of 5 * 10 cm bars, as shown in the figure. Fasten the bars with 8 cm self-tapping screws, pre-drilling the guide holes. Use a carpenter's square to make sure that the bottom corners are really straight. Attach 18 mm plywood to the frame, which will serve as the booth floor, and fasten it with 5 cm nails / screws every 15 cm along the frame bars. 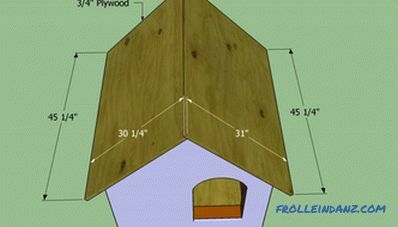 The edges of the plywood should not protrude beyond the frame. Making the base of the booth. The floor is ready, it is the turn of the construction of the walls. We recommend that you make a frame of 5 * 10 cm bars. It is more convenient to work on a flat surface. 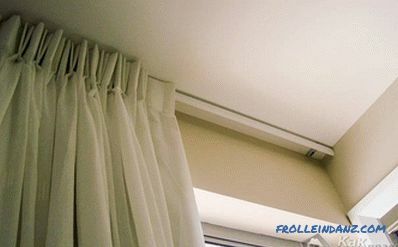 Fasten the frame walls with the base of the booth and between themselves 8 cm screws. Do not forget to check their verticality with the help of alcohol level. Installation of the batten for walls. The next stage of the project is exterior cladding of the booth walls with plywood. Cut sheets of the right size with a thin-bladed circular saw. Do not forget to make a doorway, for this you need a jigsaw. Fix the plywood sheets on the frame with 5 cm nails every 20 cm along the frame bars. External sheathing of the batten. Now we have to fasten the sheets of insulating material. Based on our own experience, we recommend that you use sheet polystyrene with a thickness of 7-8 cm, and not mineral wool (glass wool). Regardless of which insulation material you prefer, make sure that there are no gaps between the wooden bars and insulation, otherwise the insulation will not be effective. Using a hacksaw, adjust the size of the polystyrene sheets as necessary. After placing the insulation, you must sheathe the walls of the booth from the inside. Cut plywood sheets of the right size using a circular saw or cutting machine, taking care not to damage the edges. 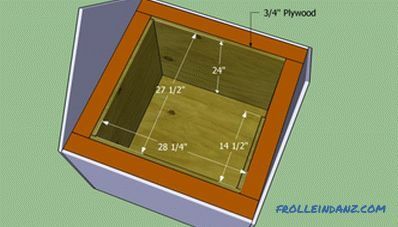 Install the plywood in place and secure it with 5 cm screws. It is important to finish all the work on the inner lining at this stage, since in the future you will practically lose access here. Internal lining of the walls. The next step is to install the rafters at the doghouse. For their manufacture, use 5 * 10 cm bars, the ends of which must be cut at an angle of 45º.Make sure all the rafters are completely equal. Pair the upper ends of the rafters in pairs and fasten them with 8 cm of nails or screws. Place connected pairs of rafters at equal distances from each other, as shown in the figure. 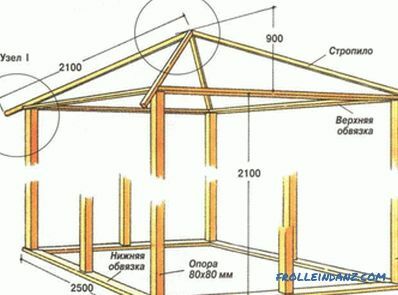 After the roof frame is ready, it is necessary to sheathe it with sheets of plywood, attaching them to the rafters 5 cm with nails every 15 cm. 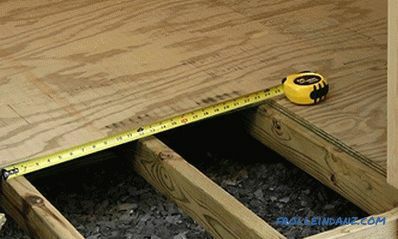 Tip: the second sheet of plywood should be slightly larger , as it must overlap the cut of the first sheet. 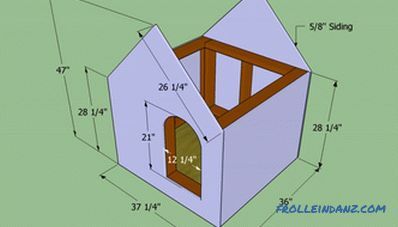 If you want to improve the look of a doghouse, you may want to consider building a canopy in front of the entrance. Start your work with the manufacture of a floor frame of 5 * 5 cm bars. Putting them together, make sure that all the angles are straight and the diagonals are equal. Lay the floor using boards 2. 5x10 cm. Hatch the heads of the screws holding them to get a neat appearance. Production of a canopy base. 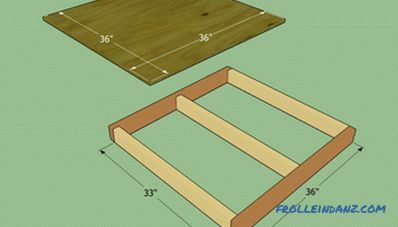 Now you need to build a canopy frame. Install the racks of 5 * 5 cm bars, fix them in place with self-tapping screws. 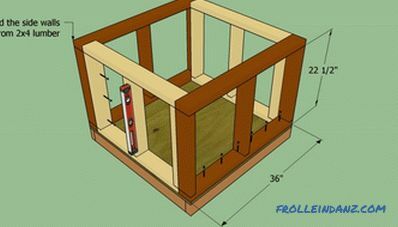 Then build a frame - how to do it, shown in the figure. Ensure that all structural elements are well aligned and securely fastened. Construction of a framework for the canopy walls. 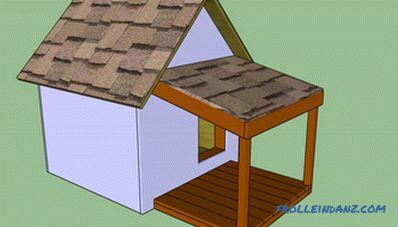 Coat the roof of the booth and roof with roofing felt, securing it with staples and then roofing tiles. Start laying tiles from the bottom of the roof. If you want to add decorative strips, you must do so before laying roofing tiles. Tip: Draw a chalk line that will serve as a guide when laying the roofing tile. The construction of the booth is almost complete, it remains to take care of the minor touches. Fill all gaps and holes with wood putty and then silicone sealant. After the mass dries, sand the surface with 120 grit sandpaper. 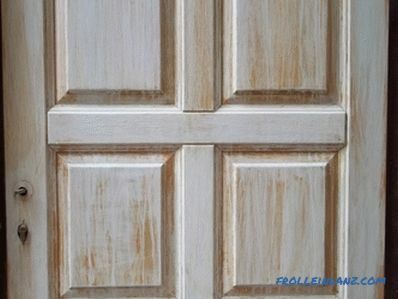 Tip: Cover the wooden surfaces with several layers of paint to protect them from damage due to atmospheric moisture. 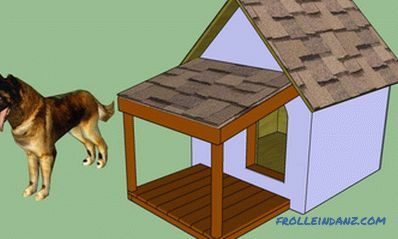 Make sure that the caps of the nails and screws are recessed deep enough, otherwise the dog may get hurt. Job completed. 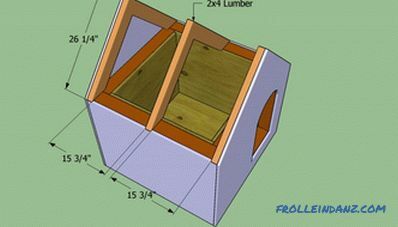 Now, thanks to our instructions on how to make a dog booth, you can be proud of the result of the work of your hands, and your pet will be sincerely grateful to you.